GUEST POST: How I Contributed $23.5k to Roth IRA/Roth 403b in 2015 as PGY2 — Future Proof M.D. Notice how in order to contribute $1,958 /mo., I am actually in the red by $1,237 monthly. Step II. Separate the monthly expenses into chargeable vs. cash required. After charging everything possible on credit card, there is $3,200 cash requirement per month, well below the $3,478.00/month I bring home. 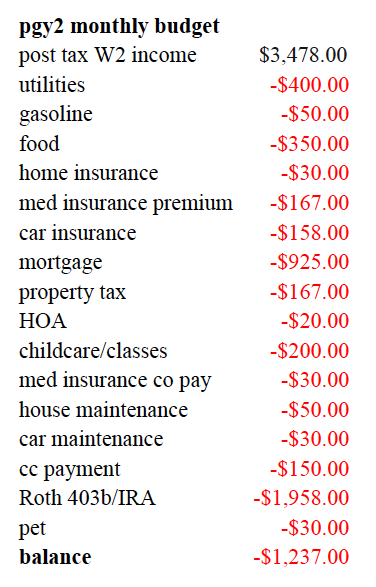 Anything I can charge on a credit card I do; this includes utilities, gas, food, home insurance, car insurance, property tax, child care/pet expenses, home/car maintenance, medical/dental copays. Why not? I get tax-free cash back rewards* and up to 21 month 0% interest on these necessities I charge on credit cards. *check out this post on how I got $1200 cash for my $4000 grocery bills in 2015 using the Discover It credit card. As I put $1,958/mo away, I’m also accumulating $1,237/mo of 0% interest rate credit card debt. By the end of the year, I would have accumulated approximately 15k of 0% credit card debt, minus 12 months of minimum monthly payments. Minimum monthly payment is usually 1-2% of revolving balance, so the net $278 cash I have covers it comfortably. Step III. Develop a plan to pay off the low interest credit card debt. The first 15-21 months, this debt from charging monthly expenses is usually negative (because of cash rewards) to 0% interest. So far I’ve been able to pay off older cards with expiring 0% with cash flow freed up from charging onto newer cards or additional income made with internal moonlighting (approximately ~200/month). I’m also looking forward to the pay raise when July 1st 2016 hits. Up-to-date result: I have put away $38,250 in Roth IRA/Roth 403b combined since 2014 and I currently have 20k of 0% interest credit card balance, which I anticipate I will never pay more than 1.7% interest rate on. Again the goal is to pay off the debt with cash or newer cards before the 0% interest expires. As long as you can keep this credit card debt interest rate < 2% annual interest, it is tax-efficient and sound debt leverage to direct your limited cash flow towards Roth contribution in index funds, bearing 8% average annualized return in the long run. What do you think? Are you comfortable with 0% credit card debt? What do you do to help you maximize tax efficiency and investment return? Comment below! Guest author Dr. Wise Money is a 1st year resident (PGY2) in the Department of Medical Imaging at Banner University Medical Center. As DWM achieves her financial goals of purchasing a home (MS4), paying off student loans (PGY1), & maxing out retirement savings (starting PGY2), she begins writing and giving talks on personal finances for doctors to help her colleagues also achieve financial success. DWM firmly believes that financial freedom makes better and happier doctors. DMW is featured on websites including White Coat Investor and Non-Clinical Doctors. You can follow DWM at drwisemoney.com.